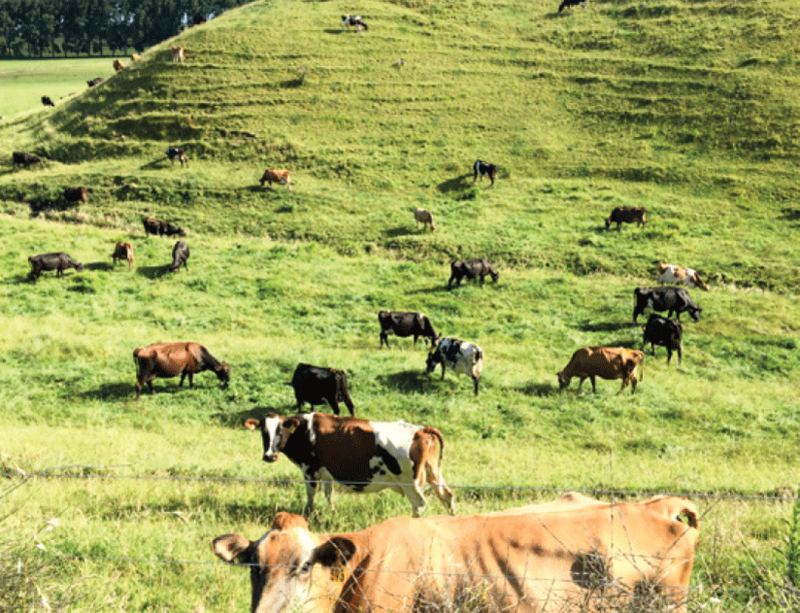 Although mycoplasma bovis has not been detected in the Bay of Plenty local farmer Darryl Jensen is ensuring he is protecting his farm from the threat as much as possible. Already being fairly self-contained has made the process simpler. The only stock he buys in is the beef bulls used for heifers and cows after artificial breeding. He gets the Simmental bulls from the Auckland Council run Cornwall Park in central Auckland and another Hereford breeder with a closed herd who he trusts. He grazes his replacement heifers off farm but once again works with a local farmer he trusts and who he sells the beef sired calves, he has raised to 100 kilograms, back to. “It’s about making sure the people we deal with have practices aligned with ours, trying to mitigate risk,” says Darryl who is also investigating the possibility of some sort of protection of the borders of his farm. Darryl farms an 115ha unit at Paengaroa with wife Kim and peak milks a herd of 330 Kiwicross cows through a 26-aside herringbone shed. The farm was originally purchased by Darryl’s parents Brian and Pat in 1958. Darryl admits he wasn’t interested in becoming a dairy farmer when he left school so he headed to the King Country to work on various sheep and beef units. He and Kim bought their first farm, a 400ha sheep and beef unit, at Waimiha. They ran this for ten years before selling up and buying into the family dairy farm in 1999. Located on two main plateaus, with a rise of only about 15 metres between the two levels, the farm soils are around 45ha of peaty loam with the balance in sandy loam. This means the majority of the farm tends to dry out over the summer months. To compensate Darryl has been planting 10% of the farm in lucerne to combat dryness on the higher ground. He says this works well, the only downside being this area of the farm not being available for grazing putting extra pressure on the system during winter. To mitigate this he ensures ample feed reserves so plants five or six hectares of oats as part of his pastoral renewal process. For the past couple of seasons he has been wintering all cows on farm. Darryl Jensen and wife Kim milk a herd of 330 Kiwicross cows on 115ha at Paengaroa in the Bay of Plenty. Pasture management was altered to cope and more palm kernel or maize silage bought in. The farm has a stand off pad, which has helped to mitigate pasture damage. “We do on-off grazing leaving residuals of around 1200 kg/DM over the winter months. We need to do everything we can to prevent damaging paddocks and encourage more grass growth,” says Darryl. Each season he sets targets for rounds aiming for 30-day rounds from 1 December extending to 40-days by 1 February and eventually 100-days by 1 June. An effluent system spreads over 25ha of the farm and is being expanded as finances allow. All waterways are fenced off and riparian planting will ensure good habitats for wildlife and help with the nutrient run-off. The planting will be ongoing for a number of years. Darryl is in his third year of serving as provincial president for Federated Farmers and a issue that the organization is focusing on is the Dairy Industry Restructuring Act review, the recommended changes to the NAIT system to make it easier for farmers to use and the climate change debate. How to make best use of his farm in the future is also on his mind. Darryl and Kim also own a kiwifruit orchard at Pongakawa with 7.2ha planted in fruit and are interested in the potential of horticulture for their dairy unit. “Our land is increasing in value and dairy doesn’t give the same profit back as horticulture does. For example one hectare might give $6500-7000 income in dairy but $50,000-60,000 for green kiwifruit or $100,000 plus for gold kiwifruit.